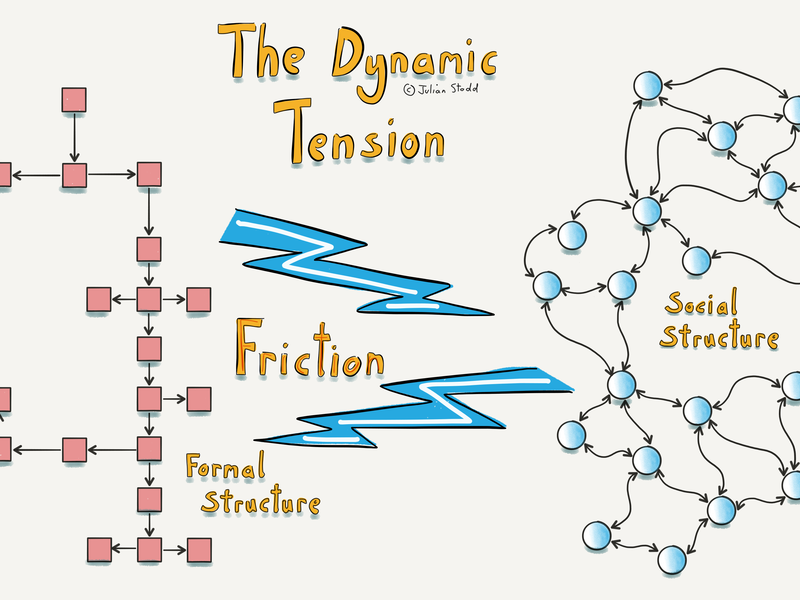 Building on yesterday’s post: there is a friction between the ‘formal‘ and ‘social‘ systems, the two sides of any organisation in the Social Age: the friction represents the power balance between the rigid type of organisational mandated authority, and the reputation based authority found in the social system. In the right conditions, there powers compliment each other. In a Constrained organisation, they conflict. To become Socially Dynamic is to leverage one off the other: it’s like playing with fire though. Performance with significant risk. Generally the risk is one of control: if one side tries to control the other through exertion of their primary power, the system fails. If the formal tries to control the social, it loses it’s authority, and if social subverts formal, it unbalances the tension. We have to learn to live with, nurture and utilise both: one through hierarchy, the other through awarded permission and trust. This entry was posted in Agile and tagged Change, Leadership, Social Leadership, Socially Dynamic Organisation, Tension. Bookmark the permalink.